I feel I've seen Lush wishlists on blogs and vlogs, or some sort of Lush post be that an haul or what not everywhere at the moment. I'm jumping on the bandwagon because I'm loving what Lush have to offer this Halloween, Bonfire night and Christmas. And I want a few Lush products from the range for Christmas. Snow fairy is definitely a firm favourite and classic amongst us bloggers, though, it's not something I'm completely desperate for. 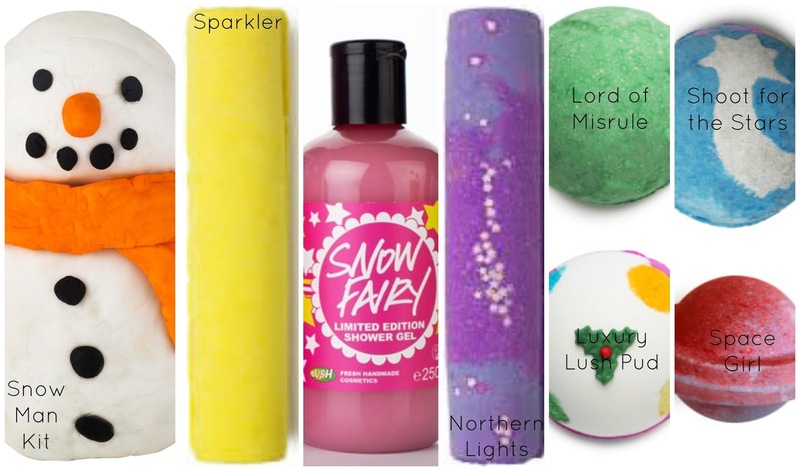 I'd love to get my hands on the bath bombs mainly and have put a (*) near the ones I'd love the most. Are there any Lush recommendations that I should try? Let me know in the comments below. Also, let me know which Christmas products you'll be getting your hands on or if you have which ones your loving. Sparkler and Northern Lights really intrigue me. Aw I love Christmas. I need some of these! I really like the Christmas Pudding one. Fab wishlist! I absolutely love the snowman kit, it smells so fruity and beautiful! After my enjoyable visit to Lush for their #LushChristmas event I did a massive shop and I'll be blogging about my haul next week so keep your eyes peeled! I love walking into Lush and taking a whiff of the brilliant aromas! What a great idea for Christmas gifts; can't wait! I love the snowman kit! So cute! You have essentially just turned everything I desire into a blogpost. Let me know if you get any of them and you should do reviews. I will too!